Classic Motorcycle Racing in the Isle of Man. Allan Brew and Luviair. Allan Brew came 2nd in the Manx Grand Prix in 1978 and had another shot at the title in 1981. Today he races classic motorcycles. Sponsored by local helicopter operations company Luviair, Allan can often be spotted roaring through the lanes of the Isle of Man. Photo. 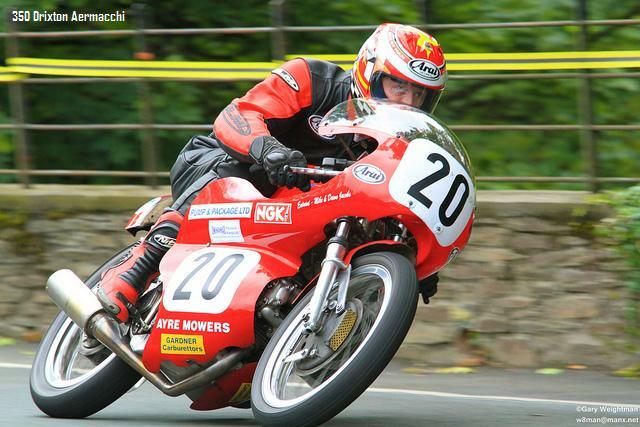 Allan Brew powers a classic Aermacchi 350 in the 2011 Isle of Man classic event. Luviair Aviation Management is pleased to be sponsoring Allan Brew. In this article Allan tells his own story. “ I’m proud to be a Manxman but was actually born in Australia. My Manx father emigrated to Australia, met my English mother and got married, had 2 children with me first in 1957 … and then my father decided to return to the Isle of Man in 1959. So I was an Aussie for 2 years. Dad had always been involved with motorcycles and actually raced while in Australia but with family and work commitments he was not able to continue until the late 60’s early 70’s on the Island. As a successful garage proprietor he was able to run a race team supporting many riders and when I decided to start racing it was very easy for me to jump on one of the bikes for a run out at Jurby which I did in 1976. I had joined the Royal Air Force in 1974 instead of going into the business on the insistence of my father, who had also served in the RAF. When I decided to start racing, I had the support from home but also from the RAF and I became a member of the RAF Motor Sports Association and represented the RAF at all the races I entered. When I entered my first Manx Grand Prix in 1978 (finished 2nd) the RAF allowed me 2 weeks off, provided a van and even paid towards some of my expenses. Despite this support and the time I had in the RAF, I hadn’t achieved my ambition of becoming a member of aircrew and I took the decision to leave in 1980 and continue racing while working with my father in a race support business. Unfortunately this business really suffered as a result of the recession at the time so in the following year I decided to stop racing on the grounds of mounting costs, despite ‘nearly’ winning the Manx Grand Prix in 1981. (Retired 5th lap in 2nd). In 1994 I bought and old road bike (Norton 850 Commando), for Sunday ride outs in the Yorkshire dales. My father heard about it and convinced me to have a go at racing again, but now on classics !! Classic Racing in the Isle of Man. Just for clarification, the ‘classic’ era, in general, is for machines that were raced between 1945 – 1972 for 4 strokes and 1945 – 1967 for 2 strokes. This classic class was introduced to allow the older less competitive machines their own race instead of competing against the ‘modern’ Japanese machinery. The first classic MGP started in 1983 along with other race meetings which introduced a classic race. The number of classic races on the Island is now limited to 2 main events, the MGP (now classic TT), and the Pre TT Classic races which take place on the Southern 100 circuit. There is also the possibility of riding in a combined classic race at Jurby which is run by the Andreas Racing Association. The procedure to start racing today is similar to when I started but it now includes some theory (classroom) just the same as getting a licence for the roads. You start by joining a club, which here in the Isle of Man would be the ARA, and with your novice licence (issued by the Auto Cycle Union) you then progress to the next grade licence depending on number of races and results. To race on the mountain circuit you need a minimum of a National licence which takes at least a year to obtain, subject to results. Most riders will also attend other meetings in the UK or Ireland to improve their experience. In addition to your competition licence, if you wish to race on the TT circuit you need to have a mountain course licence which is achieved by competing in at least 6 race events in the 12 months prior to the TT or MGP race. This means, as a classic rider, you have to compete off the IoM to get the number of races in. This year will see the launch of the Classic TT which is the classic MGP rebranded. The decision to do this has been taken by the Department of Economic Development and I believe this will be the biggest event to happen to classic racing for years and has created worldwide interest. This can only be good for the future of classic racing especially when the grids were falling and even some races being cancelled or combined. The southern 100 held in July used to have its own classic race but this was cancelled some years ago due to lack of entries. I can see this race being re-introduced taking us back to three main classic events on the Island. How do youngsters get involved in motorcycle racing? As with most sports the way in is by association and this is definitely the case with motorsport. I’m not aware of any ‘apprenticeship’ opportunities apart from motor engineering courses which are run by the college and then may be combined with work experience in the motorcycle trade.